Contact Kate at Cherry Tree Farmhouse on 01823 431622 (mobile: 07813 821475) or complete the enquiry form. Cherry Tree Farmhouse is a fantastic rural retreat. With 5 bedrooms and 4 bathrooms this large holiday home is perfect for large groups or families. What’s more with a games room complete with pool table plus use of a heated indoor swimming pool every afternoon (between the hours of 2 to 6pm), this place has plenty to keep everyone entertained. There is even an indoor play room for children plus a wooden play area outdoors in the large garden. Grade II listed and dating back to around 1600, this is a historical property with plenty of character and period features. 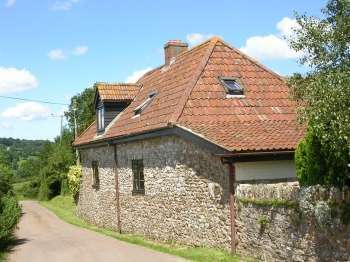 With a fantastic location just on the edge of a conservation village with a lovely local pub just an easy walk away this is a great place to stay. Situated close to Halse, which is surrounded by an area of outstanding natural beauty, this is a fantastic location for discovering some of the best of Somerset. The popular town of Taunton is just a short drive away, as is Exmoor National Park and the coast is just over half an hour’s drive away. At this holiday home there is ample room for groups or families with a lounge with wood burning stove and flat screen TV, dining room with inglenook fireplace and garden views, farmhouse kitchen with breakfast area, games room, children’s play room and utility room. A fantastic shower room can also be found on the ground floor. Of the five bedrooms, one is located downstairs and with a king size bed, views of the nearby fields and an ensuite shower room, is a lovely relaxing space. Upstairs there are two bedrooms with zip and link beds which can be made up to be twin bedrooms or superking bedrooms according to your requirements. The third bedroom boasts a king size bed and there is another large bedroom with zip and link beds plus an ensuite bathroom. Upstairs there is also a family bathroom. There is ample space for travel cots or children’s beds in three of the bedrooms. Short breaks pricing from £750 to £1800. Enjoy watching this guided tour of Cherry Tree Farmhouse.